A hoarse voice sounds different to a normal voice in either volume, pitch or quality (sometimes this is called dysphonia). For example, your voice may sound croaky, strained or weak. This is caused by a problem with your vocal cords, which are the moving parts of your larynx (voice box). 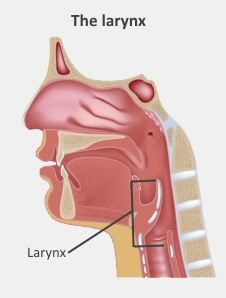 Your larynx is a part of your throat and has several different parts. Many different things can cause problems with your vocal cords. One of the most common causes of a hoarse voice is laryngitis, which is inflammation of the larynx. Laryngitis usually results from a virus, and it can often be part of another illness, such as the flu, tonsillitis or a sore throat. Other symptoms that can happen with a hoarse voice are sore throat, dry cough, mild fever and a constant need to clear your throat. Laryngitis usually gets better by itself within a week, without any treatment. Resting your voice can help you recover. Don't whisper, as whispering can strain your voice. Making sure you drink enough fluid and taking paracetamol can also help. you have a polyp, nodule, or cancer on or near your vocal cords. It's important to avoid smoking, which can not only affect your voice, but also increases your risk of cancer. you have swollen neck glands that don't get better within three to four weeks. Your doctor will let you know if you need any tests or follow-up to see what is causing your hoarse voice. They can also refer you to a specialist if necessary. Alternatively, you might want to see a private ORL specialist. ORL used to be called ENT (ear, nose and throat). ENT specialists are now called otolaryngologists (ot-o-lar-in-gol-o-gists). Any treatment will depend on what is causing your continuing hoarse voice – it may be medication, or it may be surgery. More information about what causes laryngitis and how to treat it. Written by HealthInfo clinical advisers. Endorsed by clinical director, Otolaryngology, Canterbury DHB. Last reviewed April 2018.